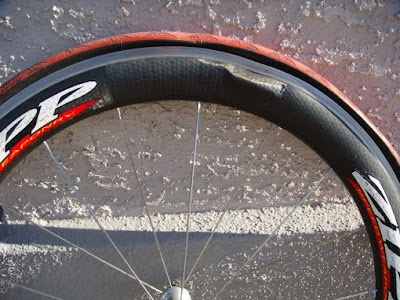 Backstedt broke his Zipp carbon rims at Paris Roubaix, the problem according to Zipp engineer Josh Poertner was that he was running 24mm tires instead of 27mm tires. Full Interview. Uh Huh. Wrong sized tire, eh? I'm sure the tire made little difference. Anyone who actually read the entire article would know that the failure was due to several factors. The combination of Backstedt's 210 lb weight, 72psi tire pressure in a 24 mm tire, race speeds and cobblestones was enough to bottom out the tire with enough energy left to ruin the rim. Given that a 27mm tire has about 20% greater air volume than a 24mm tire, tire size not only made a difference, it no doubt made a huge difference. Backstedt was amogst the largest riders, riding in one of the toughest races on the very edge of what his equipment could handle. He then decided to go another 20% over the line. It is not surprising that the rims broke. How much stronger should Zipp make their product? Should I be able to run 50 psi in a 22mm tire with full panniers? Why stop there, why not just ride on the rim with an extracycle off-road.